Kolkata, April 11: West Bengal Chief Minister and Mamata Banerjee and Congress President Rahul Gandhi engaged in a war of words on Wednesday after the Trinamool Congress (TMC) chief accused the Congress party of taking help from Rashtriya Swayamsevak Sangh (RSS), the ideological mentor of the Bharatiya Janata Party (BJP), in the Lok Sabha elections. Rahul Gandhi made a fierce response to Mamata Banerjee's allegations. "Don't give a single vote to the BJP and don't give a vote to the Congress. They are hand-in-glove with the BJP. In Behrampore, the Congress leader is fighting... I hear with RSS help. In Jangipur, Pranab Mukherjee's son is fighting with RSS help. Even here (in Darjeeling), the RSS is helping the Congress candidate," Banerjee, a vocal critic of Prime Minister Narendra Modi and the BJP. Reacting to Banerjee's accusation, Rahul Gandhi reminded the TMC chief about her past ties with the BJP during which she held ministerial berths at the centre. "Mamata Banerjee is saying we are not really fighting the BJP. But then, who raised the Rafale issue? Who raised the slogan 'Chowkidar Chor Hai'? We have never compromised with the BJP ever anywhere in any state. Has Mamata Banerjee ever compromised with the BJP anywhere ever?" Gandhi asked. Mamata Banerjee on PM Narendra Modi Biopic: 'People Will Watch Films on Gandhi & Ambedkar, Not Him'. Mamata Banerjee, who started her political career with the Congress and formed her own party in 1997, had joined the BJP-led National Democratic Alliance two years later. She held the coveted railways and the coal and mines portfolios in the NDA governments led by Atal Bihari Vajpayee. 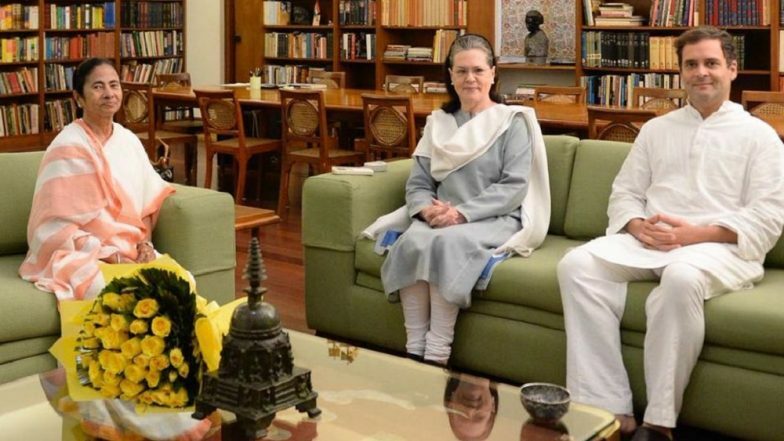 While on the national front, both Banerjee and Gandhi attack PM Modi and the BJP relentlessly, in West Bengal the two parties have not been able to work out an alliance for the Lok Sabha elections.